Picking up where we last found Cheap Trick, on 2003's "Special One," the veteran American rock band jumps back in with another great set of strong songs balanced between hard-charging rockers and tender ballads. The original lineup remains intact; their insistent rhythms and high-energy approach are also undimmed. Best of all, so is their songwriting ability. "Come On Come On Come On" could have been lifted from one of their classic 1970s albums; "Perfect Stranger" is as intriguingly constructed song as they've yet written. And "O Claire" is the sort of melancholy yet beautiful love song Paul McCartney used to write, while "Give It Away" could have come from Van Halen's catalog. In other words, they're all over the map  yet another indication that things remain as they should be in the world of Cheap Trick. For one of the hallmarks of Cheap Trick has always been that the band's talents were elastic enough that there was never a Cheap Trick "sound," no trademarked hook or riff that would instantly identify one of their songs as belonging to Cheap Trick. 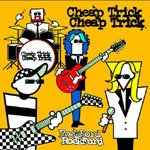 Add the above to the fact that Bun E. Carlos is still thrashing his drums, Rick Nielsen is one of the few guitar heroes of his generation still learning new licks, and Robin Zander remains one of the most powerful singers in rock 'n' roll and you end up with one of the best albums Cheap Trick has yet turned out.